You scream, I scream, we all scream for ice cream! 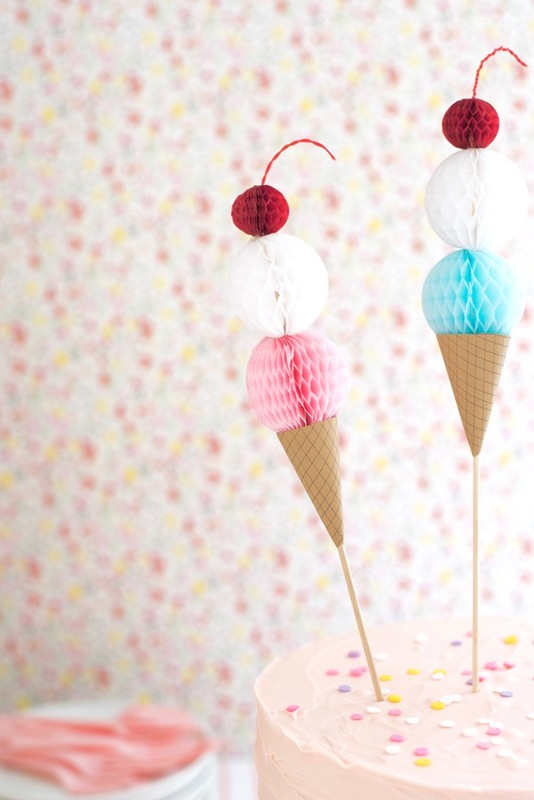 Nothing cuter than a combo of honeycomb balls and ice cream cones, right?! 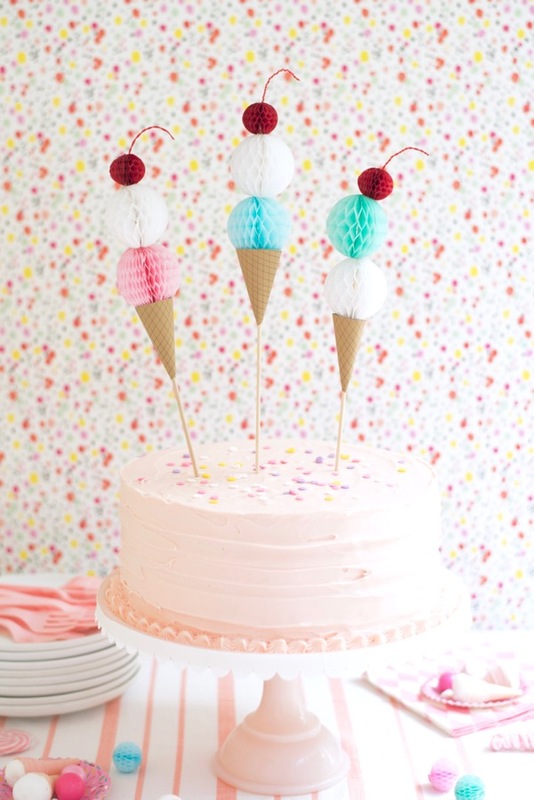 Use whatever colors you want and stick it in whatever cake you want, just don’t forget the cherry on top! 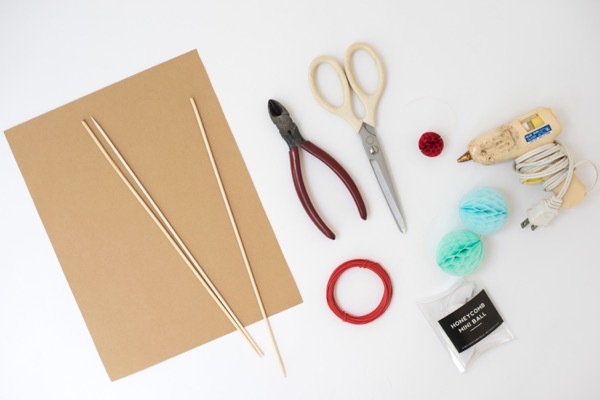 Materials needed: 2” honeycomb balls, 1” honeycomb balls, bamboo skewers, Ice Cream Cone Template, craft paper card stock, red wire, scissors, wire cutters, hot glue gun. 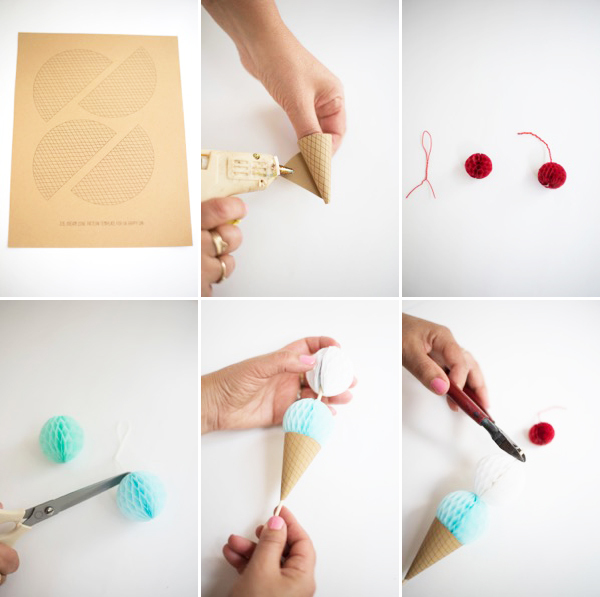 Step 1: Download and print out the Ice Cream Cone Template onto craft paper card stock. Step 2: Cut out the cones. 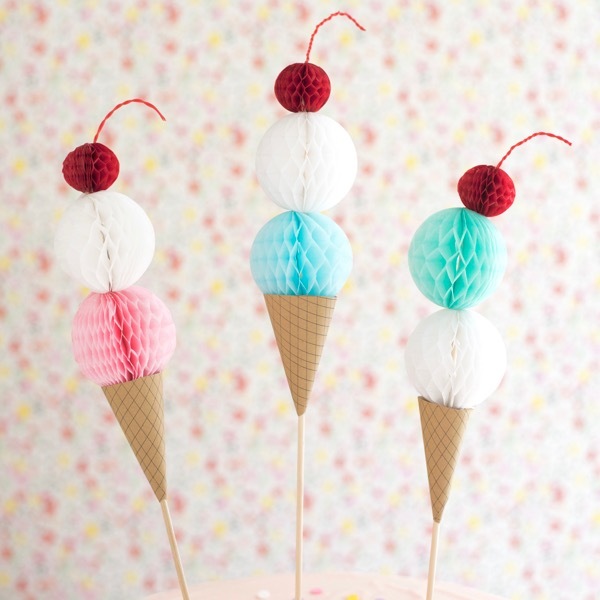 Gently twist the pattern into a cone shape, using hot glue to close the cone. Leave just enough of an opening at the bottom of the cone for a skewer to fit through. Step 3: Cut a 6” piece of red wire, fold it in half and twist it together. Snip off the ends. Open a small red 1” honeycomb ball, and insert the wire into the top of it. It may stay by itself or you may need a dab of hot glue to secure it. Bend the wire slightly to one side. Step 4: Open two different pastel-colored 2” honeycomb balls. Snip off the hanging string. 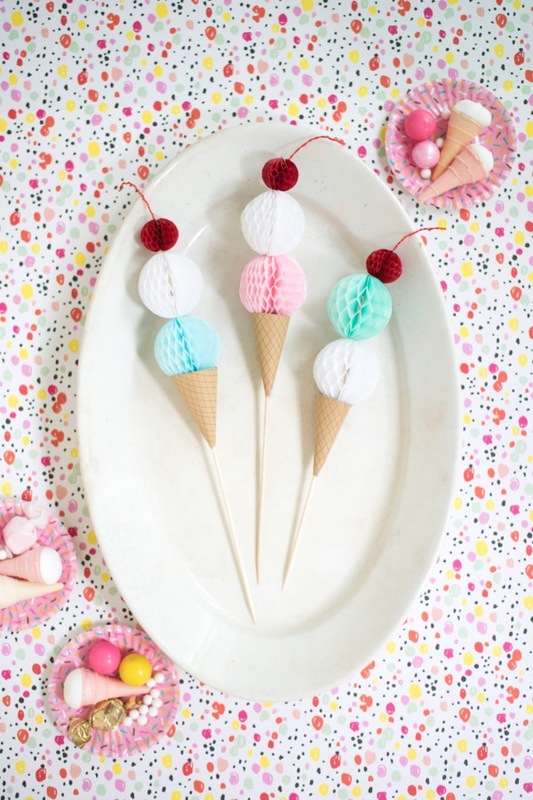 Step 5: Insert the skewer into the cone and pastel balls, leaving a few inches for the skewer to insert into the cake. 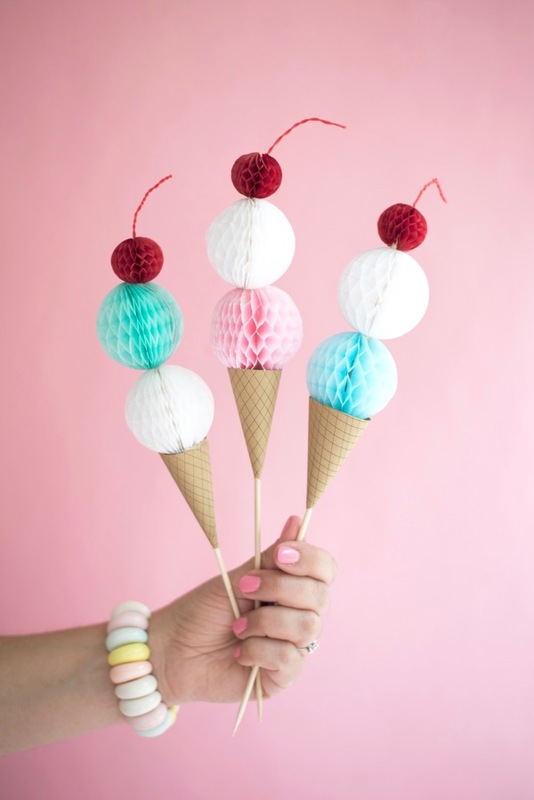 Use hot glue to secure the cone and the balls to the skewer. Step 6: Using the wire cutters, cut off any extra skewer at the top of the pastel ball. Using hot glue, attach the “cherry” to the top of the cone. Step 7: Insert into cake and enjoy! Awesome ice cream cone cake. It’s a really beautiful. I love one. Thanks for sharing great post. So adorable! 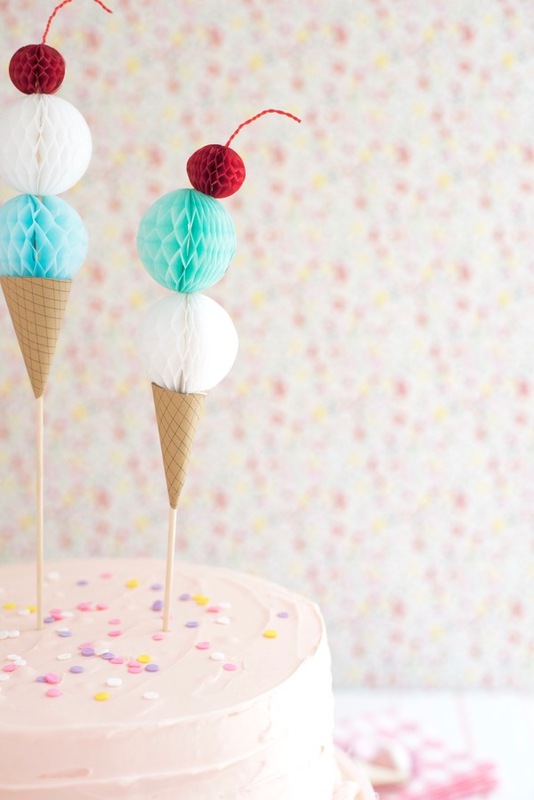 Easy to make and cute to decorate in any party cake.Thanks a ton! Absolutely the cutest thing ever!! What a cute idea! So perfect for summer (and who knew how easy? ).